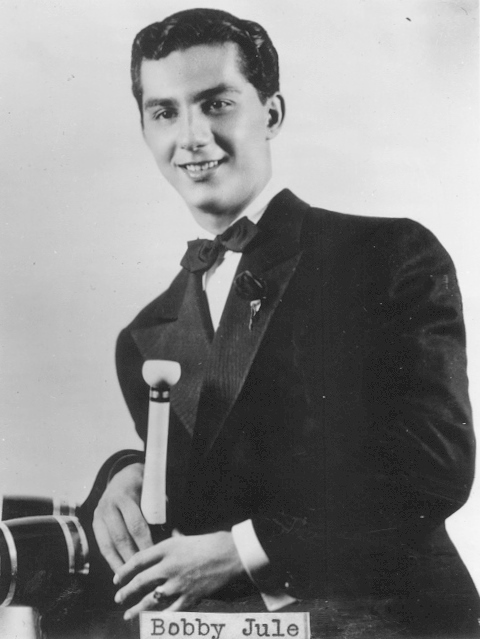 Bobby Jule was born Joe Pegnato in 1924 in New Castle, Pennsylvania (USA). He is now a spry and active 90 year old who looks closer to 70. 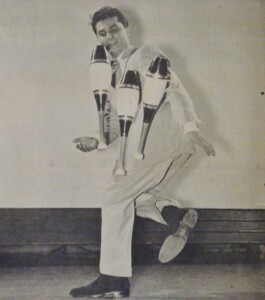 He was one of the breakout juggling stars from the USA in the 1940s and enjoyed a forty year performing career. 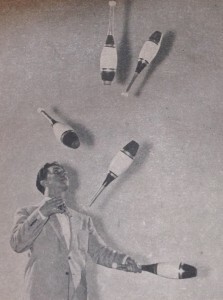 A trick that he invented in 1943, the gag of tossing up a ping pong ball and catching it balanced on the tip of the nose with the aid of rubber cement, is still performed by jugglers, magicians, and comedians today. 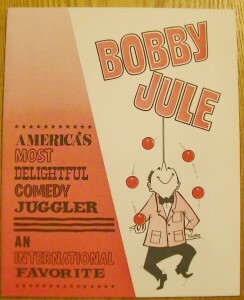 Bobby Jule was a versatile and successful juggler who traveled around the world entertaining audiences. I think you’ll enjoy learning more about him. Please note that this article features the first ever publicly available video of Bobby Jule’s act, not seen by jugglers, or even by Bobby, since 1957! DC: Please tell us about your background prior to starting juggling? BJ: My parents came from Italy as immigrants in 1907. They raised a family of ten children; I was the youngest of seven boys. We (and practically all of my relatives) lived in New Castle, PA. Work was plentiful in the mills there and that was the prevailing nature of work for immigrants in those years. I was two when we moved to Pittsburgh, PA, so that my oldest brother could attend college. The move was also beneficial for the entire family. As long as I can remember, my family was interested in gymnastics and all of my brothers participated in competitive gymnastic meets. Our coach was Russian and a gymnast himself, and our school won the city championships twenty-one years successively. Two of my brothers achieved gold medals. I did as well, but in the club swinging competition. (Most people today do not realize that club swinging was once an Olympic event.) I earned a gold medal every year in the city competition and won a silver medal at the state level. I honestly think I lost first place as a result of using decorated Harry Lind clubs and inserting a toss of a club during the routine; this was a departure from the usual two-minute swinging routine using one-pound wood clubs. I think the judges did not look kindly at the show business aspect of my routine. DC: How did you learn to juggle? Who were your influences? BJ: I started to juggle at the age of thirteen using wood clubs from the gym and billiard balls that were around the house for whatever reason. 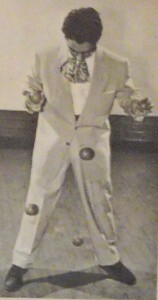 I was so naive that I did not know that jugglers used rubber balls. Up to this point, I had never seen a juggler. During an assembly featuring our gymnastic team, I juggled one-pound clubs and the billiard balls. 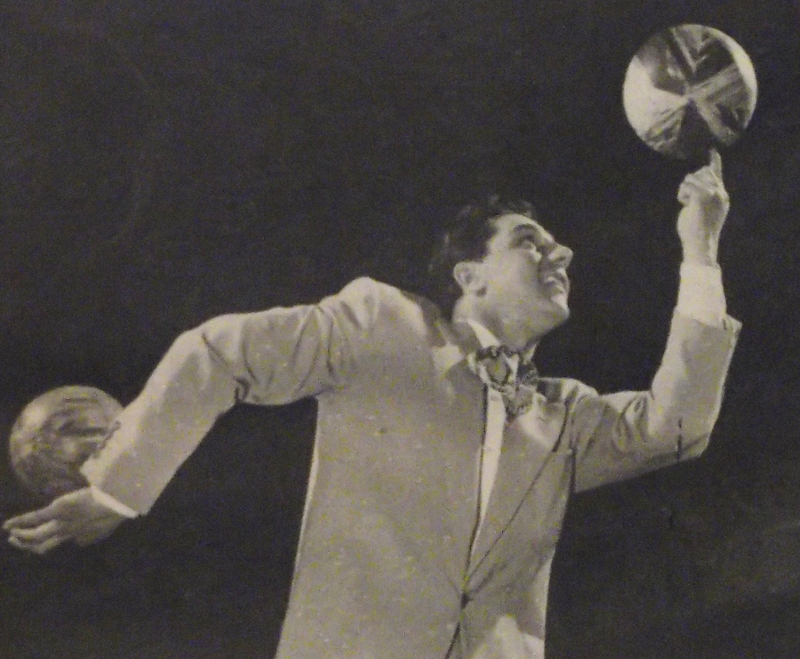 As far as anyone teaching me to juggle–it never happened. It was trial and error. There were no instructional manuals available then and it wasn’t until I saw juggling acts at our two amusement parks—Kennywood and West View—that I began to see the possibilities. Outdoor shows using high acts and stage shows were always a delight to see every Sunday. 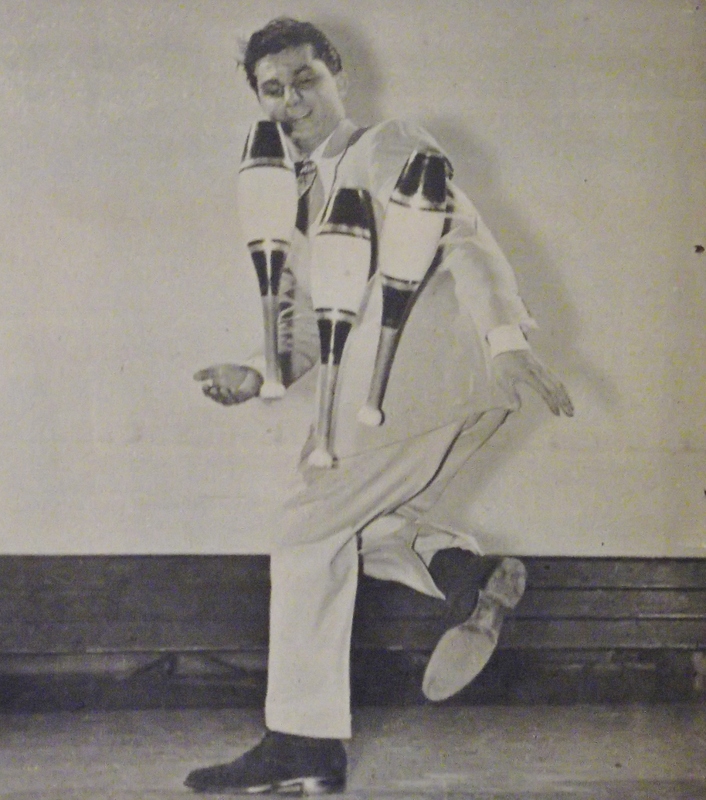 Art Jennings, the founder of the IJA, was the first juggler I met. He was very supportive and encouraged me as I started out. Art was talented in many areas, one of which was as an industrial pattern maker. He crafted several of the props I used in my early days. DC: Please tell us about how you started your performing career and how it progressed over the years. BJ: I met Pryde Shannon after his show and introduced myself as an amateur juggler. He was rushing to play a double date and could not spend much time with me, but invited me to visit the next day at his hotel in downtown Pittsburgh. It was a small hotel catering to acts and, when I got there, I had to wake him up. Show people have a different set of hours. Pryde said, “Let me see what you can do.” I did some three ball tricks. He said, “Hell, you do more stuff than I can do—let me take you to an agent.” He took me to Bertha Elsner, one of the many theatrical agents in town, and on Pryde’s recommendation, she booked me. In 1942, the nation was at war, times were booming, and there was a lot of work for small time acts to play charter clubs, like Moose, Elks, Eagles, night clubs, beer gardens, etc., with at least a dozen theatrical agents supplying acts. Mrs. Elsner booked me into the Moose Club in Fairmont, West VA for a three day engagement. (I suspect, if I had bombed there, it was far enough away to not hurt her reputation as a booker.) My salary for three days was $13, included transportation, and they gave me free room and board. I managed to stretch my routine with balls, clubs, and tambourines for a ten-minute routine. I was so nervous that I couldn’t remember the reaction of the audience. But it didn’t matter—I was in show business! That summer of 1942 was exciting: I was getting bookings all over the tri-state area—mostly at charter clubs and, every once in a while, a bona fide night club with good bands and more sophisticated audiences. 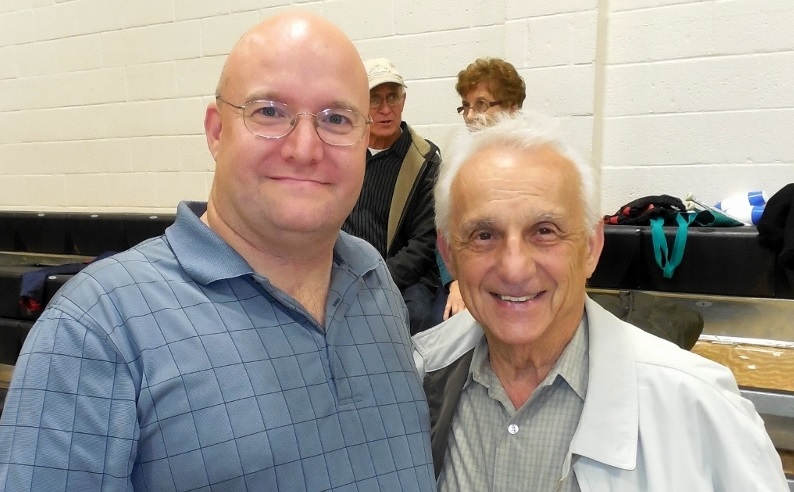 At this time, I met Sid Marke, an old time agent, who was an exclusive booker for Kennywood and West View amusement parks in Pittsburgh, and also Warner Brothers Theaters in Western Pennsylvania. Marke told me, “Kid, you have a lot of personality and I think you will do well. I would like to manage you.” No one had expressed such an interest in me and I hated making the rounds of agents in looking for work. Marke’s sincerity had impressed me and, a few days afterwards, I signed a personal management contract with him for three years. The original three-year contract then extended with a hand shake and lasted for forty years. Free from the business end of juggling, I concentrated on practicing and improving my skills. There were plenty of jugglers I wanted to emulate and I saw a few of them at the Stanley Theater in downtown Pittsburgh. 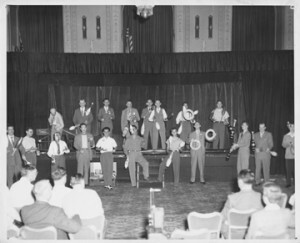 The Stanley had stage shows, usually a big name orchestra and three variety acts. This was where I first saw Boy Foy, a juggler on unicycle, both low and high, doing fantastic combination tricks. Also, the Three Swifts doing club passing. But it was Bob Du Pont, a comedy juggler, with simple tricks that made me think, “I could do that!” Later, I saw Bobby May perform and he became my idol. I just knew I had to practice and keep practicing. 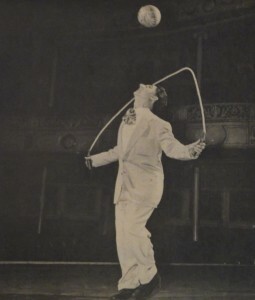 I saw other juggling acts, such as the Juggling Jewels, a five lady act passing rhinestone clubs, and the Christiani family of three men and two ladies in formal attire doing fast tempo club passing. Also, I saw Chester Dolphin with ball and stick and fantastic head balancing while juggling; Woodrow, specializing in top hats; Ben Beri, doing balls and clubs; and Trixie, a petite blonde, doing everything from rings, ball, and stick, to spinning a hoop on her arm and leg while performing a one-arm handstand—all while on ice. Another ice skating juggler, Serge Flash, performed with ball and stick. I was fortunate to have seen Truzzi featured in the center ring of the Ringling Circus, doing tremendous juggling at a fast pace. DC: You were at the founding meetings of the IJA at the IBM convention and pulled a great prank om your fellow jugglers. Can you tell us about the meetings and the prank? 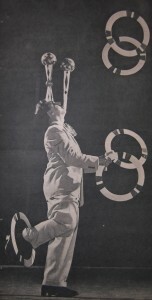 BJ: When the Ringling Circus was in town, Tony Renda, a hand balancing friend of mine, and I were walking around the circus tent. A flap was open and we noticed several jugglers practicing; it was the Chiesa boys. They were very friendly and, knowing we were interested, invited us to join them. Vinicio and Sergio Chiesa spoke very little English, but I managed some elementary Italian and invited them to a local park, where we juggled together and had a great time. It just so happened a group of jugglers was having a small get-together at the IBM convention at the William Penn Hotel in Pittsburgh, and Tony and I thought it would be great to invite the Chiesas to go along with us. I was called upon to demonstrate some tricks. Then, as a gag, I introduced the Chiesas as “neighborhood boys” who were just learning to juggle. I threw three rings to Sergio so that he could demonstrate his juggling—then a fourth and a fifth ring. By this time, Sergio got impatient and went full barrel at juggling six and seven rings, and Vinicio joined in to complete the surprise charade. The audience at that first time meeting of jugglers went crazy. The boys continued to show some of their advanced juggling and concluded with Rastelli’s trick of six ring juggling, head balance, ring on the one foot, all the while hopping a jump rope handled by Vinicio and Tony Renda. Those watching went wild, and the event was talked about for years. 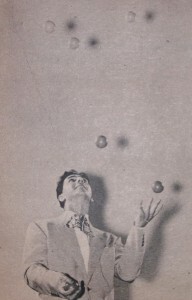 The 40’s were formative years for me as a juggler. My agent Sid Marke booked me with Joe Karston’s Calvacade of Stars, a vaudeville type show that traveled from Maine to Florida. Karston was a former magician with extraordinary skills for promotion. His shows consistently out-grossed “big name bands” on the road. Marke thought that working in theaters was the most important experience for learning timing, especially when attempting comedy, and the theater was the only place to learn feedback. Any other show business, learned in clubs and doing banquet rooms, could not compare with theater audiences, who are sitting in front of you, with entrances on your stage right or stage left, and are not distracted by food and drink. I was with Joe Karston’s productions for three seasons. It was hard work, doing four and five shows a day, and playing mostly one-day stands; occasionally, we played a three-day week. But I was young and having an exciting time. I worked with a variety of acts, some of which were old timers and I learned a lot from them. Gene Gory was one of those who taught me a lot. He was a former Ziegfield Follies star who originated the “Crazy Band” concept that Spike Jones copied in the forties. 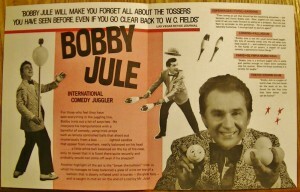 During my formative years as a juggler, I saw as many jugglers as was possible without the availability of television. 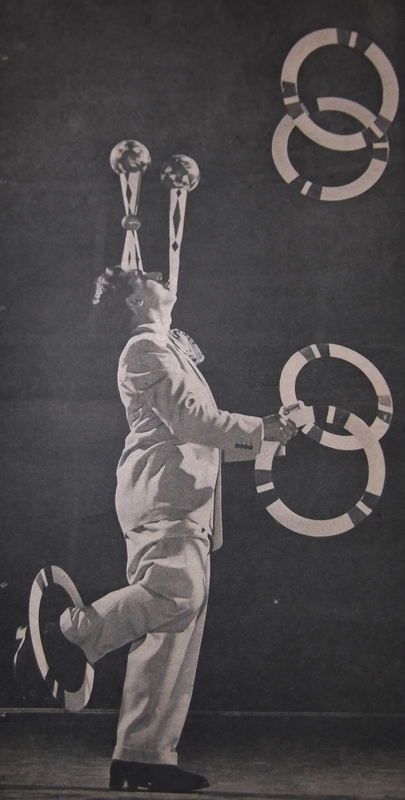 On occasion, I would see jugglers who were working in parks and night clubs—Ben Mowatt and partner, Lou Folds, in full dress attire, producing all of his props from under his cape; Billy Rayes, tap dancing while juggling short sticks; Siki, doing cups and saucers to a head balance while on rolling globe; and two lady jugglers Lorraine Vernon and Winnie Mae (who many do not know was Bobby May’s sister). I also saw George Carl who was one of the best hat manipulators and not a juggler at all, but a superb pantomimic eccentric dancer. He was also a friend and we shared many club dates together when we made five dollars a night. I also remember Woodrow, at thirteen, doing every top hat trick imaginable at Radio City Music Hall. I was working at the Palmer House in Chicago when I first met Francis Brunn. He was at the Chicago Theater and billed as the “World’s Greatest Juggler.” After seeing many of his shows, I wanted to meet him personally. He could not have been nicer. I told him that I was at the Palmer House and he said he would be over to see me. So, one day, he came to my show. An army friend of mine, “Red” Edwards, was visiting me backstage at the time before the show and I was visibly nervous; “Red” tried to calm me by saying, “Just say to yourself that you are the greatest juggler in the world!” I took him to the stage curtain, pulled it back a bit, and showed him the audience. I said, “See that guy at a front table? 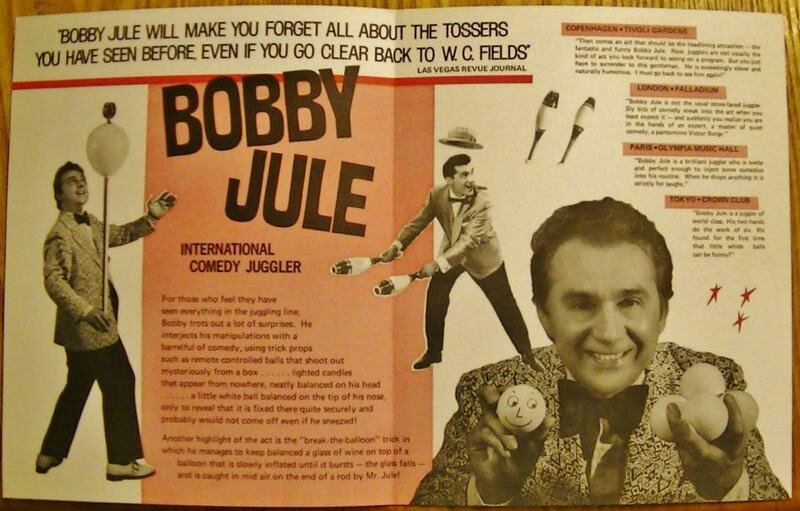 Well, he is the world’s greatest juggler!” Personally, I never liked to know who was in the audience. It always affected my timing and demeanor. With Brunn in the audience, I did a reasonably good performance–it could have been better. DC: You traveled quite extensively around the world. Do you have any anecdotes from your travels that you’d like to share? BJ: Nightclubs were a great source of work in the 40’s—from small and sophisticated to large theater restaurants. In Cincinnati (more accurately, across the river in Kentucky), there was a multitude of first rate clubs, such as the Lookout House, the Primrose Club, the Glenn Rendezvous, and the Beverly Hills Country Club. These clubs always had big name attractions and productions with chorus line dancers. Both Boston and Detroit had Latin Quarter clubs. Buffalo was well known for its Town Casino; Pittsburgh had its Vogue Terrace and Jackie Heller’s Carousel; Cleveland had the Vogue Room at the Hollendum Hotel. There was also the Brown Hotel in Louisville, the Mayflower Hotel in Akron, the Shoreham Hotel in Washington, D.C., the Henry Grady Hotel in Atlanta, the Jefferson Hotel in St. Louis, Mt. Royal Hotel in Montreal, and Chalfante-Haddon Hall in Atlantic City. Las Vegas’ El Rancho Hotel and Casino was on a two-lane highway when I played an engagement there in 1950. All of these places played the biggest names in show business. Of course, playing large theaters was the ultimate reward. I played the Chicago Theater in Chicago with Louis Armstrong and the screen feature was the first run “Glen Miller Story.” The show was a block-buster and ran for five weeks. Francis Brunn was in Chicago at the time, and he came to my show. I was never a show-stopping act, but it so happened I hit on all cylinders one particular evening performance and stopped the show. Francis came back after the show and said, “Geeze—you only do three balls and you stopped the show.” I smiled sheepishly, as if this was a common occurrence. Actually, in forty years, I accomplished this only two times. I was on a bill with Guy Lombardo and his Orchestra at the Downtown Theater in Detroit, in a show that preceded Frank Sinatra, at a time when his fans were waiting at the airport for his arrival. I also appeared with other popular bands, like Tony Pastor, Ted Lewis, Buddy De Franco, Charlie Spivak, Glenn Gray, Buddy Morrow, and the Glenn Miller Orchestra fronted by Ray Mc Kinley. It was always a big plus for an act to be backed by a big band. The icing on the cake was to play the Palace Theater, the icon of vaudeville in New York City. Later, I played the Strand Theater on Broadway; during which time, Trixie was at the Roxy, Rudy Cardenas was at the Paramount, Bob Du Pont was at the Palace, and Jacques Cartier was with the Ice Follies. The Strand Theater engagement was a pivotal moment in my career, going back to when I was seventeen. I borrowed some money and took a bus to New York City, stayed at the YMCA, and went to see a prominent juggler (who shall remain nameless) who was playing the Strand Theater at that time. After stopping at the stage door entrance and asking to meet the juggler, I was ushered in and was excited to meet with him. He asked me to show him some three ball tricks, which I did. His response was “Kid, everyone and his brother can do those tricks. My advice to you is to go into the army when they call you, and forget about juggling.” Naturally, I was devastated. This encounter only strengthened my resolve and determination. Seven years later, I was on the Strand Theater stage, occupied the same dressing room, and was being handled by Eddie Smith, his former agent. Another New York engagement was next: closing at the Apollo Theater in Harlem with Billy Ekstein, when I was the only white act on the bill. They were a great audience. 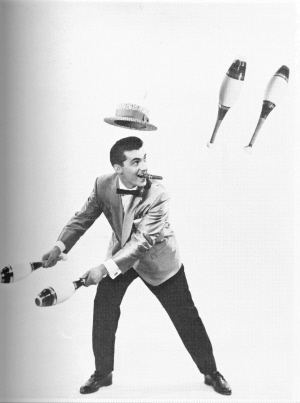 Shortly after, I appeared on the Ed Sullivan Show, and then the Paul Winchell and Jerry Mahoney TV show—on which I might have become the first to juggle five clubs on television. Following the change of direction in developing my act, I was booked at the International Hotel in Havana, Cuba with Perez Prado’s Orchestra and the Dancing Waters Spectacular. It gave me the opportunity to try these new ideas in the act before leaving for my European bookings. DC. What were the routines and tricks that you were best known for and most proud of? BJ: With newly decorated clubs and the dog trick in hand, I left for a series of engagements in Europe. My act was basically three to five ball juggling and three, four, and five club juggling. A three club kick-up was a “big” trick for me. I started my career trying to impress the audience with technique, but I found a comedic approach was more satisfying to the audience. So, I developed a routine wherein I would do one serious trick followed by a comedic effect. Laughs were more important to me than receiving applause. I would do a legitimate trick and follow it with a gimmick that “exposed” the trick. For instance, a routine involving a legitimate balance trick would be “exposed” by magnets, a fake blindfold, Velcro, or double-stick tape. Another routine used a mechanical device to toss balls to me to juggle. In the routine, a ball would go errant and I would shoot the ball with a blank from a 22 pistol, prompting a “surrender” flag to pop up from the errant ball. Some thought I was more of a magician than a juggler and I embraced that criticism. In addition, my musical arrangements accented individual tricks, which was a departure from the usual background music. I was fortunate that I juggled at a time when opportunities were abundant and I could experience many different venues. There were banquet dates, theaters, night clubs, charter clubs, TV shows, etc. But I also appeared in circus tents, fairs, amusement parks, ice shows, show boats, a penitentiary, a bull-ring in Spain, USO shows—some staged on the back of trucks—and even “intermission” during boxing matches when I was stationed as a private in Fort Knox, KY.
My first date in Europe was at the International Sporting Club in Monte Carlo on New Year’s Eve in 1958. Afterwards, I performed at casinos in Cannes and Nice, on the French Riviera, and in San Remo, Venice, and Campion, in Italy. My most prestigious date was next, at the Olympia Theater in Paris, with Edith Piaf, France’s biggest star. It was a four-week engagement with five international acts. From there, I went to Spain and played numerous night clubs for several months, including Circo Price, a permanent indoor circus. After that, I was booked in Scandinavia, where I appeared in Stockholm’s Grona Lund Park and Gothenburg’s Liseberg Park. My final engagement was in Travemunde, Germany, the equivalent of Monte Carlo. 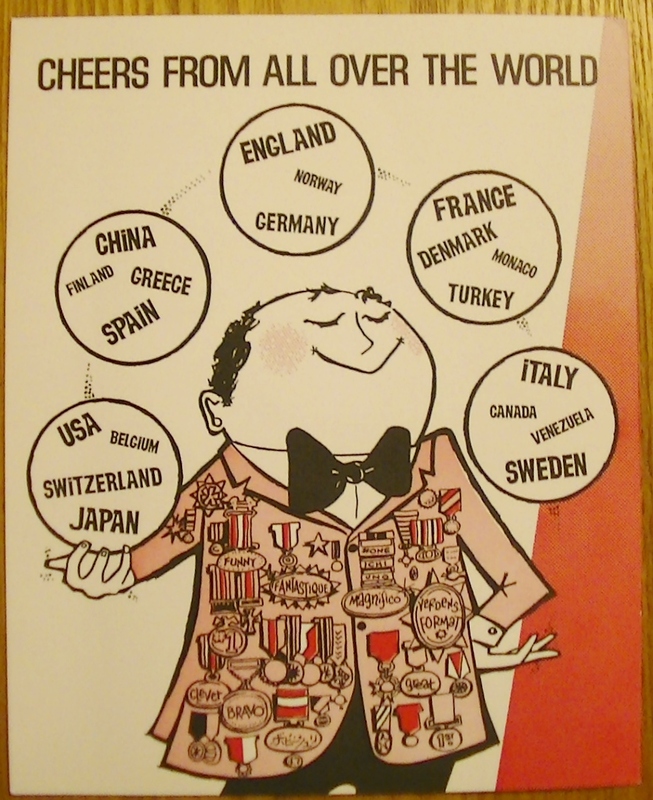 Travemunde had one of the nicest printed souvenir programs of all of the places in Europe. I had discovered that they had promoted my electronic dog part of the act with a description in the program. For the first time, I thought they would be justified in canceling my act since I no longer used the dog in the act. I explained to the stage manager that I had abandoned the trick, because it was unreliable. Opening days were always tense, but this was especially scary because the Germans love mechanical gadgetry. My fears were unfounded. Opening night went well without the dog and they were happy with my performance. Thereafter, I enjoyed one of the best dates in Europe. After nine months of engagements, I concluded what was to be the first of many return trips to Europe. After I had played most of the bookings that the Marouani Agency in Paris had arranged with Mark Leddy, contact was made with the Grade Agency in London and a lot more dates opened in England. Brian Roxbury, a booker for Grade, kept me busy for most of my time in London. In the following years, I played the Savoy Hotel three different times, the Palladium twice, the Victoria Palace Theater, and the Talk of the Town Theater Restaurant, the largest venue in England, for an entire summer. The Talk of the Town had been converted from the former Hippodrome Theater and had five moving stages with big productions featuring English and American headliners. Another club was the Piccadilly Theater Restaurant, in the heart of London, and a most unlikely event occurred on my closing night there. I noticed a fibre case baggage that looked identical to mine. I was totally surprised when I saw a tag with Bobby May’s name on it! That’s right—Bobby May was following me into a club after many years of not seeing each other. The last time being when I played at the Chicago Theater in 1954. We met, of course, and shared a snack and some memories. At this point, there was a big difference in our ages and I must admit a bit of melancholy and sadness in our meeting. Bobby May was my idol and a great guy. On another occasion in London, Francis Brunn was at the Palladium and I was at the Savoy Hotel. We met after our shows and renewed our friendship from our first meeting in Chicago. He was expecting to play the Savoy and wanted my assessment of the stage and lighting conditions. I was amazed that the world’s greatest juggler would be so apprehensive about something like that. 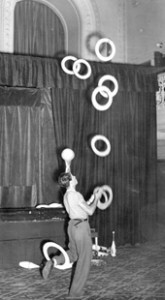 I later read in interviews with Francis that he admitted to experiencing the same nervousness that most jugglers feel. The Savoy Hotel was my last engagement before leaving for America. Francis drove me to the airport and, as a favor, I delivered a large painting of his daughter to his mother at the airport in New York. Going back and forth between America and Europe became routine for me, and it was always exciting and challenging. Between the trips to Europe, I played a variety of banquets, private clubs, and annual engagements with George Arnolds’ Ice review at the Ankara Supper Club in Pittsburgh. Bookings were again offered to me in Scandinavia, and I performed in Norway, Sweden, and Finland. Scandinavia was different from Europe in many ways— I was surprised at the warmth of audiences there and how they applauded in “unison,” as opposed to applause as we know it. My favorite booking in Scandinavia was the Glasshalen Music Hall at the Tivoli Gardens in Copenhagen. Otto Lington, the conductor of the Tivoli orchestra, became one of my best friends and we corresponded for years afterwards. Seven newspapers reviewed the opening night and their write-ups of my performance were the best I ever received. It also wasn’t unusual to receive a bouquet of flowers on closing night. My most unforgettable date in Europe was when I was booked to appear on the Vorentscheidung “Deutsche Schlagerfestpiele” TV Special 1966 in Berlin. I was the sole act in a show with eighteen of the top singers in Europe. My music arrangements were rewritten for Werner Mueller’s forty-piece orchestra. All of my expenses were paid for, from Pittsburgh to Berlin, and they even provided me with a personal valet. It doesn’t get better than that! DC: When and why did you retire? What have you been doing since you retired? BJ: The business as I knew it was starting to decline worldwide. Venues I had once enjoyed changed drastically. The big name bands had disappeared and the stage shows with them. Expansive theater restaurants had become “entertainment bars,” with perhaps just a comic and one spotlight. Show business as I knew it had practically disappeared. Las Vegas, with their lavish productions, seemed to be the last option—which was limited—and the emergence of ocean cruise entertainment had never interested me. I limited my tours abroad to the summer months and enrolled at Carnegie-Mellon University in Pittsburgh. I graduated with a College of Fine Arts degree and later earned a Master’s in Education from the University of Pittsburgh. Oddly enough, limiting my availability resulted in some of the best bookings I ever received. One summer, I landed a return booking at the Tivoli Gardens in Copenhagen. During other summers, I worked in Turkey and Greece, and eventually Japan, Taiwan, and Hong Kong. I qualified for a sabbatical after seven years of teaching. Out of the blue, I was offered a contract for the Crazy Horse Saloon in Paris, which I was willing to accept. When I learned the small size of the stage and the low ceiling, I opted out. The owner, in response, offered to lower the stage and enlarge the floor area, and I accepted. However, after I arrived, I discovered that they had added what amounted to a step down from the stage that was barely two feet wide. The Crazy Horse Saloon was a cabaret below street level, the concrete ceiling was vaulted, and the tables were anchored to the floor. The ceiling height and small stage was not doable for me. 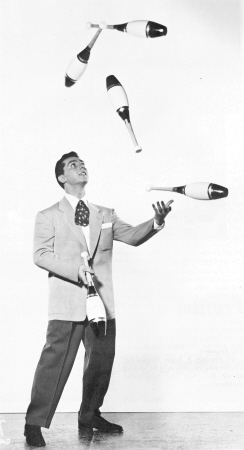 All of my traveling and hotel expenses were paid for, and my career as a juggler stopped forever. It was 1982 and I retired after forty years in show business. I retired a second time in 1992 as a teacher, after teaching Art History, Graphic Arts, and Calligraphy in high school and college for twenty-one years. DC: Please tell us a bit about your life apart from juggling? BJ: I have had two wonderful careers and been blessed with an understanding and supportive wife. Maria and I have been married for sixty-one years and she has been the guiding force in everything I have done in my life. My older son, Kevin, owns and operates an investigative, protection agency and a martial arts studio in downtown Pittsburgh. My younger son, Bob, lives in Naples, Florida, and owns a company that specializes in constructing steel structures to house solar panels nationwide. I am contented in my retirement to stay close to home and keep busy with my home, gardens, and work shop (that houses practically every tool known to man). Film making has always been my hobby and I have an extensive collection of film and DVD’s documenting my travels and show business. DC: Do you keep in touch with jugglers today? What do you think of the juggling community today? BJ: I attended a few of the IJA Conventions since I retired and most recently attended the “Not Quite Pittsburgh Festival.” Paul Bachman has been a good friend and, through his generosity of sending CD’s and DVD’s covering jugglers past and present, has kept me fully informed. I have, for several years, kept in close touch with Paul Ponce, whom I regard as one of the greatest present-day jugglers. 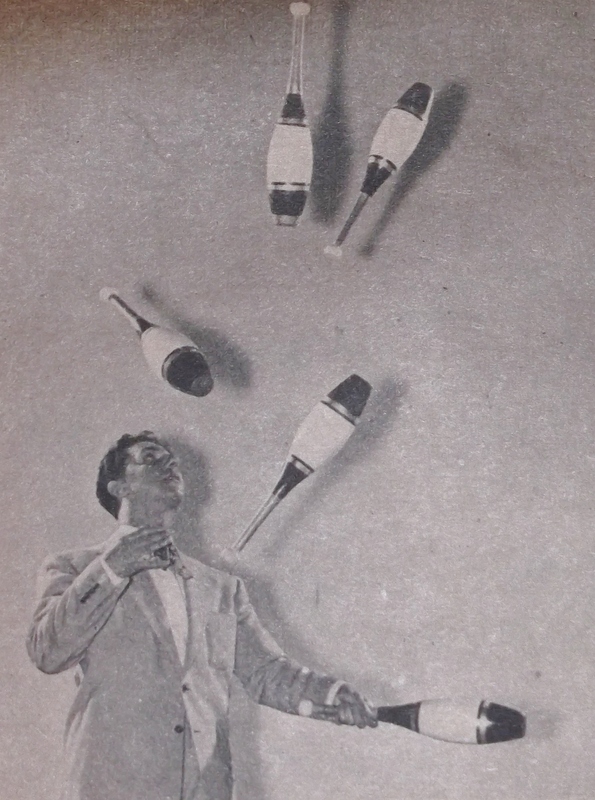 As for the present juggling scene, I am amazed at the skill levels and the innovation of patterns that were not even thought of in my day.